Blasting away at a young man with a knife on an empty streetcar. The Ontario Federation of Labour (OFL) responded to news that Constable James Forcillo will be charged with second degree murder in the shooting death of Toronto teen Sammy Yatim by saying that justice won’t be satisfied until there is full accountability for the police response. 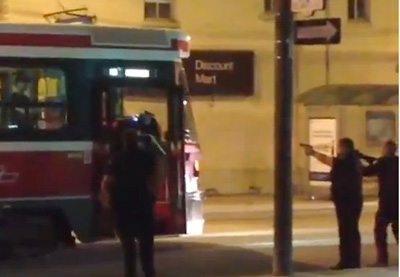 Questions about the police response to crisis incidents were raised when the news broke on July 27 that 18-year-old Sammy Yatim had been shot dead and tasered on an empty Toronto streetcar. The entire incident was caught on video and sparked public outrage over the excessive use of force. The OFL responded by demanding an independent investigation into police training, policies and practices from the highest levels of decision-making right down to the front line response. The OFL believes that the tragic death of Sammy Yatim shares many common details with the dozen other people in mental crisis who have been shot by Toronto police over the past twenty years. It says that it is time for the Attorney General of Ontario to impose uniform guidelines across the province that require any police response to focus on de-escalating tensions, diffuse confrontation and save lives. “We are hoping that this murder charge will send a message to police that they cannot shoot first and ask questions later, but we can only prevent other unnecessary deaths if we indict the system that created the conditions that allowed this tragedy to happen,” said Ryan.